Last year, Eugene and I took a last-minute trip to Paris in December. This time of year in Paris is sort of equal parts magical and miserable. Magical because it's the holiday season so the entire city seems to be twinkling with fairy lights, festive store windows, and Christmas trees decorated with paper bows. Oh, but the weather! December is the grayest month in Paris and the sky seems to blend into the zinc rooftops of the same color. It rains constantly, alternating between a chilly insipid mist and torrential downpour that switches to the other the second you get used to one. Fortunately, there was soup! 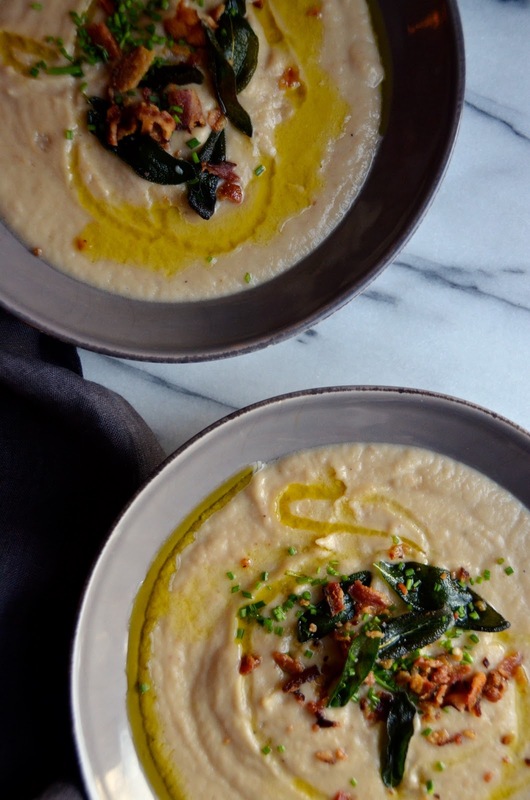 Thick, rich, creamy bowls of pureed chestnut soup, to be exact. It was on just about every single menu we saw, and I ordered it just about every single time I saw it. On the flight home, Eugene and I talked about the things we enjoyed the most about our trip and for me it was chestnut soup. You don't have to put up with rainy gray Paris to enjoy a wonderful bowl of chestnut soup. 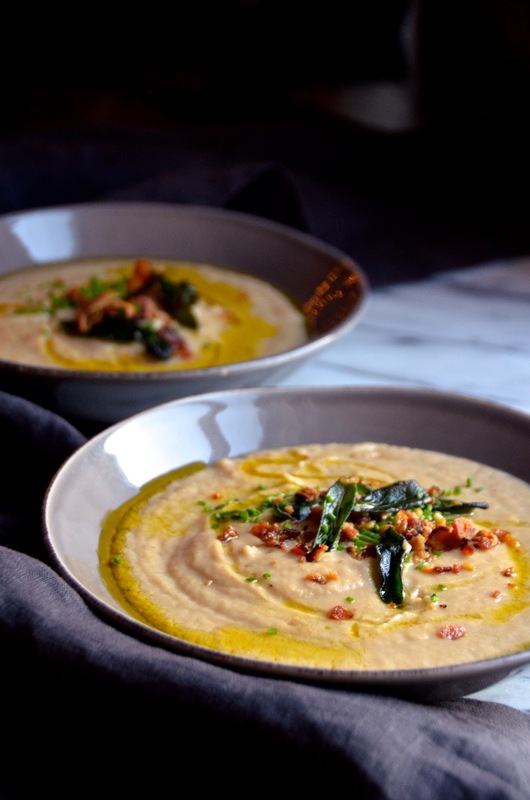 It's really very simple to make (one of those everything in a pot and puree kind of soups! ), provided you can get the chestnuts. I found fresh ones at the grocery store that I scored, roasted, and pureed myself, but you can also buy them already peeled in jars or the frozen section of gourmet stores. It's a little bit pricey, but so lush and lovely. If you'd like to save money, you can replace half the chestnuts with an equivalent amount of roasted parsnips, rutabaga, or even just classic potatoes. This is the sort of soup that would make a wonderful starter for a Fall or Winter dinner party (it's perfect for the holidays! ), but can also work as just a lush and cozy dish any night of the week. Chestnuts can be a bit pricey, so feel free to substitute a third to half of the chestnuts in this recipe with an equivalent amount of parsnips, rutabaga, or potatoes. Melt the butter in a large heavy Dutch oven or saucepan over medium-high heat. Add the onions and saute about five minutes until translucent. Add the garlic, chestnuts, broth, sage, rosemary, and 2 teaspoons of kosher salt. 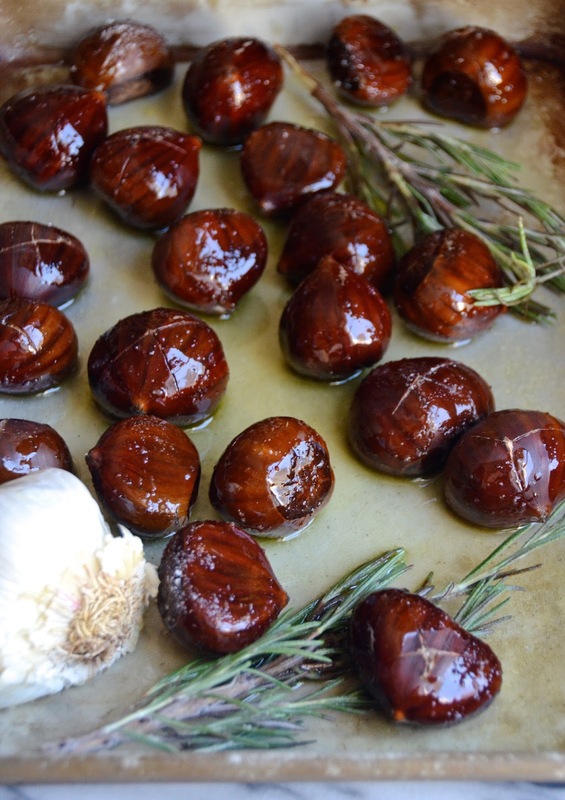 Bring to a boil, then reduce heat and let simmer about 30 minutes, or until the chestnuts are tender. Remove from heat and puree the soup in batches until it’s all smooth. Stir in the sherry and cream and let simmer and additional 10 minutes. Taste and add salt, as needed. Serve hot, garnished with bacon, sage leaves, chives, and a drizzle of olive oil.